Okay, so here is my weakness...not a big piece of chocolate cake. Not a beautiful slice of fudge brownie pie. But Brussels Sprouts my friends. I love these things! Just one look at those crispy outer leaves is enough to set my heart a fl...utter! I ate this whole bowl in one sitting...those leaves you see are as crisp as potato chips! YUM! Preheat the oven to 400 degrees. Spray a baking sheet with non stick cooking spray (I use Pam with butter). In a large bowl, add the butter and the olive oil and minced garlic and stir. Slice the sprouts in half lengthwise and trim the bottom stems. Toss the sprouts with the olive oil and butter mixture. Spread out on a baking sheet and salt and pepper to taste. Roast for 30 minutes turning them every 10 minutes. Season with more salt and pepper if needed. 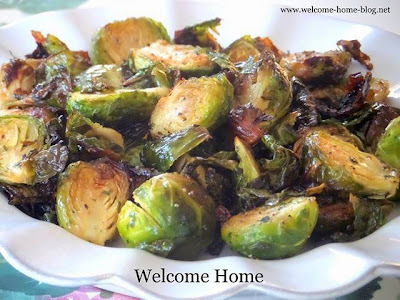 Brussels Sprouts are one of my favorite veggies. I will certainly try this.